Flowers are the best symbol of gratitude. When you want to say ‘thank you’ then nothing but pink roses are considered as the best medium. Amongst the many variants of roses available, pink roses are most sophisticated medium for the expression of love filled with lots more of gratitude. 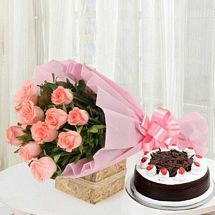 Valentine Day, Birthday, Anniversary, Rose Day or any other specific day when you are supposed to express gratitude with hidden words of love and care, and then of course pink roses can help you out in this simplification. Every happy celebration is cheered up with gifts and goodies. But sometimes, it becomes a tough job to pick gift relevant to each occasion, at that point of time, when you need something more expressible than gifts, flowers takes the best position and that too roses. Roses with their beauty and adorable presentation stay in everyone’s heart. Therefore no matter if you want to ‘Say Sorry’ or just want to convey an expression of thanksgiving the most elegant present is nothing but pink roses. We are truly in your services and are ready to deliver fresh and fragrant pink roses to anywhere across India. Whether you want us to deliver Pink rose with gifts, bunch of pink roses, pink roses bouquets, pink roses special arrangement, we are all the way ready to deliver it in rural as well as urban locations of the country. You are only supposed to Send Pink Roses Online to India from us and we will be honored to convey your feelings with fragrant pink roses.